Nigerian OAP, Toke Makinwa just finished her “On Becoming” book tour in south Africa. My Bodyguard Big W..We had such a blast..Thank you for looking after me in South Africa..crazy guy. 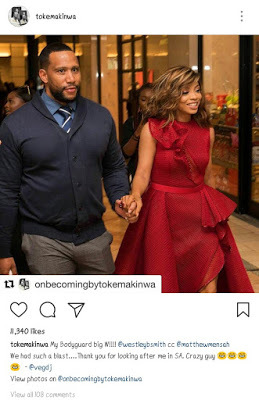 Toke Makinwa, who went to promote her book at “On becoming” book at South Africa, is known to be fan of big hulky guys, Her ex husband, Maje Ayida is also a hulky guy as he is a fitness instructor.